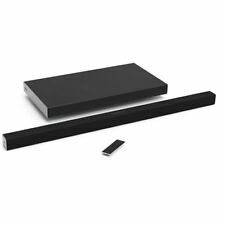 Wireless Bluetooth Speaker 4.2 SoundBar Remote Control TF Card TV/Cellphone/Tablet Sliver Feature: 1.Easy operation: Plug & play with a USB cable, no need for batteries or power cord. 2.Clear and sleek: Ideal for listening to music or watching movies and videos. 3.Convenient and Portable: Allows users to enjoy favorite game audio, music and movies, without worrying about valuable office space. 4.Good compatibility: Connect to the desktop, laptop, TV, smartphones, mac, MP3, MP4 and so on. 5. 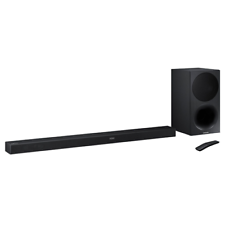 This 38" 2.1 system with a soundbar form factor features a subwoofer frequency response ranging from 50 Hz to 100 Hz and a sound bar frequency response ranging from 50 Hz to 19 kHz. Trending at $284.95eBay determines this price through a machine learned model of the product's sale prices within the last 90 days. Enjoy your music wherever you go, indoors or outdoors with these DUAL 3-way speakers. Weather-resistant design and construction provide optimum durability for permanent or temporary outdoor use. 40 mm polypropylene cone midrange. Body has scuffs. Unit has small tears in speaker fabric on right-side corners. 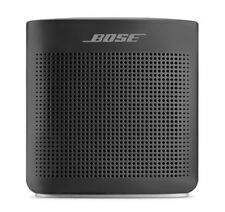 5 out of 5 stars - Bose SoundTouch 20 wireless music system(355589-SM2). 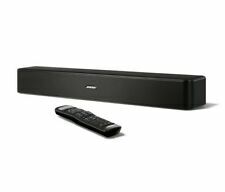 52 product ratings52 product ratings - Bose SoundTouch 20 wireless music system(355589-SM2). 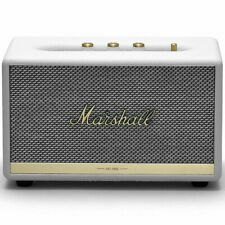 Place Beatbox Portable in the corner of any room to fill it with legendary Beats by Dr. Dre bass and style. If you’re on the move, Beatbox Portable is light enough to take the party with you. Beatbox Portable supports SBC, AAC and Apt-X Bluetooth codecs, you'll always get much higher quality sound than most other Bluetooth devices. The larger tower design of the T652 provides enough output to fill the largest listening spaces, while not overwhelming the décor in more intimate settings. While most tower speakers are priced individually, for this great price you get a pair of speakers, plus everything you need to start enjoying them right away, including the speaker wire. 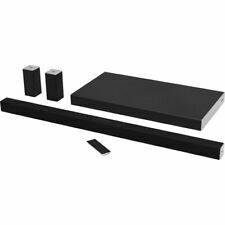 7.1-channel surround soundbar with DTS:X, Dolby Audio and Neural:X upmixing technology. 13 speaker drivers (8 in soundbar, 4 in rear surrounds 1 Subwoofer). Good condition. Original box with complete accessories and 1 year parts and labor warranty. MPN LU43PB, LU43PW. Dual LU43PW. Model: LU43PW. Tweeter Size 0.79 in. Woofer Size 4 in. The coaxial audio input of these speakers allows audio signals to travel farther allowing more flexibility in the location of the speakers, without a loss of sound quality. Whether it is enhancing the experience of listening to vinyl, keeping a party going, adding to a home theater system, or crafting an immersive TV experience, speakers and subwoofers are essential home audio equipment. Speakers in general are compact machines that can produce sound, and subwoofers are a certain kind of powered speaker that specializes in bass tones. Read on to learn about how to choose speakers and woofers and how many you need. A home theater a combination of audio and visual electronics that are meant to bring the atmosphere of a movie theater into the home. Typically, this means having a large TV or projector and a surround-sound system. Surround sound means positioning several speakers around the edges of the room so that the sound can come from all directions, just like in a movie theater. Different speakers can serve different roles. 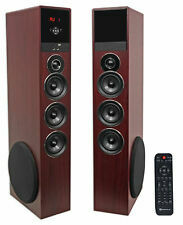 For example, larger speakers might become the front set that sits near the TV and plays most of the sound. Smaller ones might be rear speakers that aren't used as often. A good subwoofer is key because it handles all of the deepest tones, which takes a special design. How many subwoofers do you need for a home theater? To complete a home theater setup, the minimum recommendation is for one subwoofer. That is enough to get the powerful bass that defines the theater experience. However, some people do try out getting two subs. That won't double the power, but it can increase the quality of the low end. In addition, it can split the bass between two origin points, improving the surround quality of the low-end performance. Two subwoofers should be adequate for a room of ordinary size, but adding more than two can really boost the sound quality for home theaters set up in large rooms or with top-shelf systems. How many watts does a home subwoofer need? Unlike amplifiers for electric guitars, higher wattage does not always mean louder output when it comes to subwoofers. This is because watts might determine the maximum volume of a sub, but the owner sets the actual volume. A higher-watt sub might sound better than a low-watt one even when both are set to the same volume. More wattage might mean a larger size and ability to drive bass waves and better clarity. 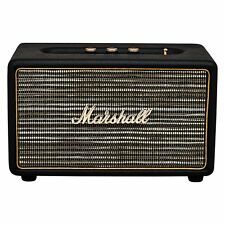 Therefore, wattage levels that would be suitable for a very large space on an amp, like 1000 watts and up, might be acceptable in a subwoofer for home use.